Techy stuff - you can ignore this paragraph if you wish :D Yesterday I found several emails in my spam folder that turned out not to be spam - they referred to problems with coding on the old template I was using. Apparently it had html stuff at the bottom that had links that Google had deemed inappropriate - it's more detailed than that but I really don't understand any of it :D I went to change the template and found that the template provider had removed it herself (they gave me warnings it would happen but I didn't see them because they were in the spam folder - that's technology for you! ), so I threw up a basic template and will have to start rejigging it. I'd love to figure out how to make a montage photo collection of some of my projects and put it in the header - I see that on many blogs - I think it's a great look! Notebook cover made with F8's from Quilt a Bag in Markham :) This was a Christmas gift for my friend Nancy :D Folded, it measures 8"w x 10"t.
Look forward to seeing your new header. I just changed my blog slightly. 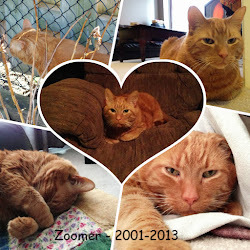 I changed the header using picmonkey. At least the emails surfaced eventually. I use 'Photoshop Elements' for combining photos, but I believe there's lots of free ones available. The robot superhero cape looks fabulous!!! Awesome Christmas present from hubby!!! Honestly I did not like the blog template you were using :-) You might find this tut helpful: http://prettybobbins.com/2013/04/09/tutorial-improving-my-blog-header-and/ Send me an email if you need any help. Happy New Year! Oh, no? What a pain to start anew. Then again, it's probably going to give you a chance to try some new stuff which is great. I'd love to know how you do that collage thing, too. I love the super hero capes. 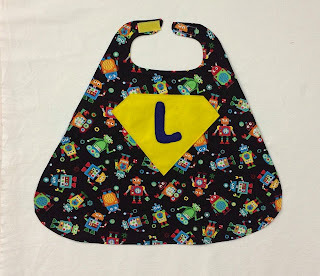 I figure moms can just turn them to the front for gigantic bibs when needed as an added bonus. That trip to Joann's was a great gift. Shall have to mention that one to my husband. With a Joann's practically next door here, I'll have to push for another Garment District trip instead of Joann's. Good thing you got that done Sunday. I don't think you would want to be in the mess we New Yorkers have moving in for the next couple of days. Up to two feet is expected. Brian is going to teach me how to use the snow blower. My life is so exciting. Okay, maybe not. I love that notebook cover, my talented friend! It is going to replace the old and boring notebook I have used for random recipes for lo, these many years! Thank you so much! Hi Sandra, I love the lemons in the background. I haven't changed my blog template for years and I have never looked in my spam folder. I have used pic monkey to make collages but I use Fireworks on my Mac to make my header the right pixel dimensions. It is like photoshop the difference for me being that I can work Fireworks but have no idea about Photoshop. Love the cape.